BELOW ARE PRODUCTION STILLS, SCANS AND TV CAPTURES DEPICTING CONNOR'S ROLE IN THE FILM. 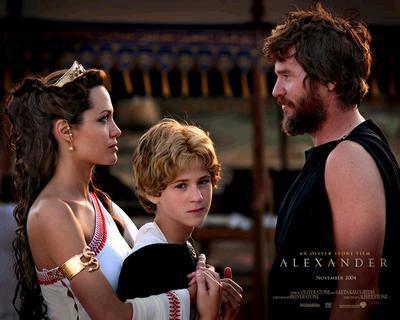 THE ROYAL FAMILY OF MACEDON: QUEEN OLYMPIAS (ANGELINA JOLIE), PRINCE ALEXANDER (CONNOR PAOLO) AND KING PHILIP (VAL KILMER). 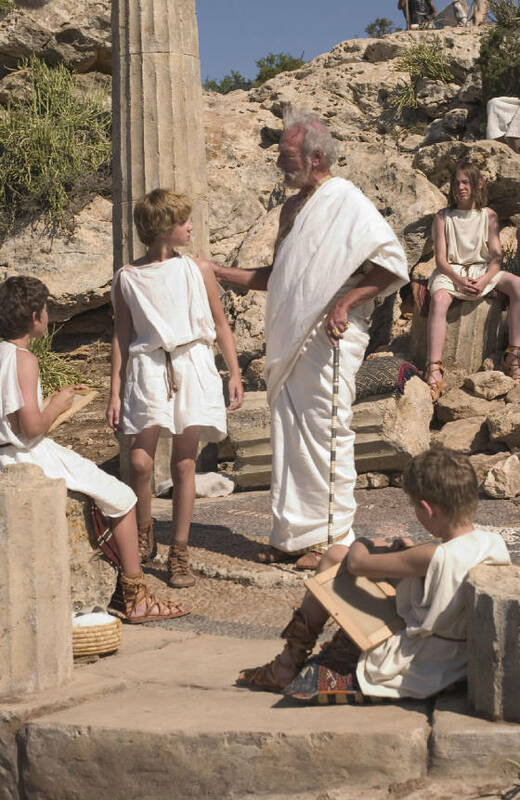 ALEXANDER AND THE SONS OF THE NOBILITY ARE TAUGHT BY THE GREAT PHILOSOPHER, ARISTOTLE (CHRISTOPHER PLUMMER), IN THE RUINS OF A TEMPLE TO PALLAS ATHENA. 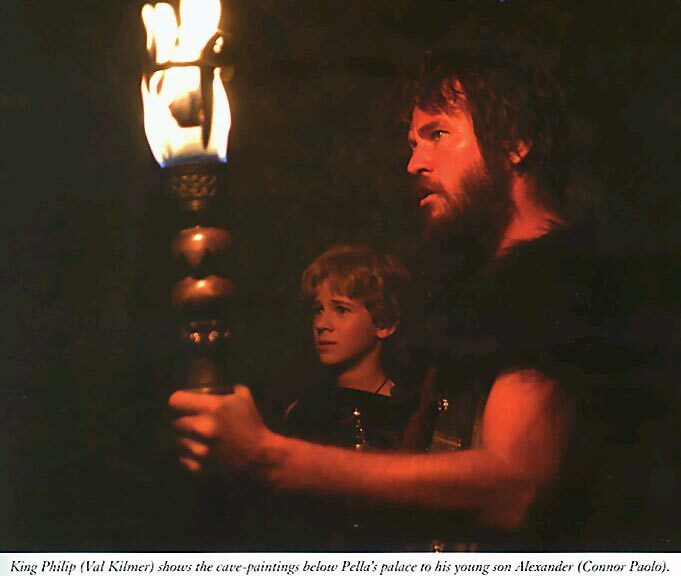 THIS PICTURE IS SCANNED FROM A PHOTO FROM AN ARTICLE ABOUT THE FILM IN PREMIERE MAGAZINE. IT DEPICTS YOUNG ALEXANDER RISING TO TAME THE WILD STALLION, BUCEPHALUS. OLYMPIAS AND YOUNG ALEXANDER'S FRIENDS FOOK ON WITH CONCERN AS HE RIDES BUCEPHALUS. 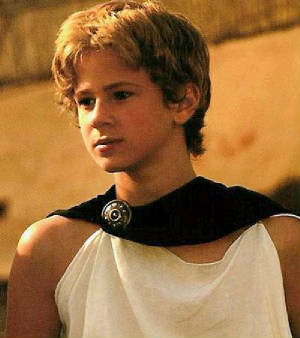 "Also trained by Cruz Moral was 13-year-old Connor Paolo, who was cast by Stone to play young Alexander. 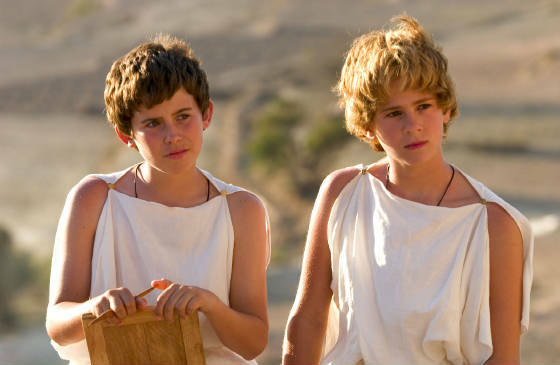 Paolo had to master the skills required to effectively portray Alexander's fateful first meeting, and subsequent taming and bonding, with the wild stallion Bucephalas - a catalyzing moment for a young Alexander, who in achieving what several experienced horsemen had failed to do, dramatically won his remote father's approval. Having grown up in New York City, Paolo had no prior experience on horseback. Cruz Moral trained him every day for two months, and by the time the cameras were ready to roll, he rode like a true Macedonian prince. " "ALEXANDER'S HORSE WAS AN EXTENSION OF HIS SPIRIT AND HE BONDED WITH BUCEPHALUS AS MUCH AS HE DID WITH ANY OF HIS GENERALS. IT'S IMPORTANT IN THE FILM...YOU CAN SEE THE LOVE BETWEEN ALEXANDER AND BUCEPHALUS." THE TWO IMAGES ABOVE ARE SCANNED FROM THE BOOK, "THE MAKING OF ALEXANDER." 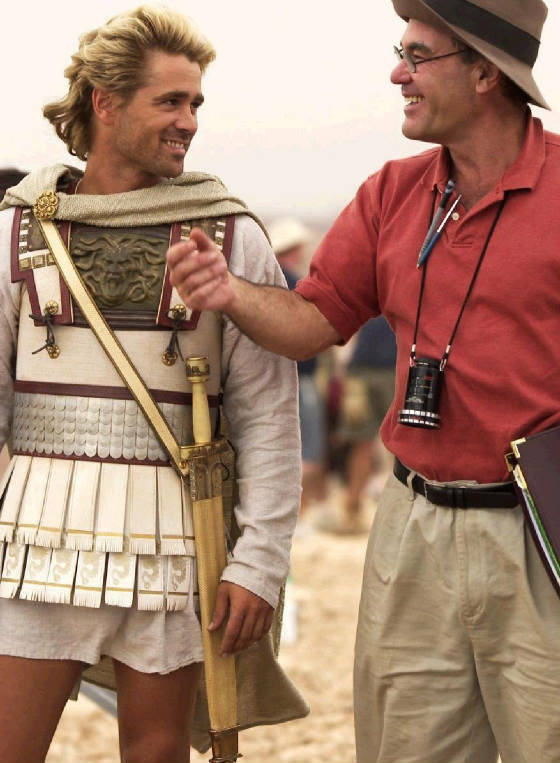 ALEXANDER THE ADULT: COLIN FARRELL AND OLIVER STONE.